Looking for a broadband plan is a bit like looking for a gas or electricity plan—you know you need it, but all the options can be confusing. Indeed, there are dozens of broadband providers in the UK, but the sheer amount of choice has its benefits. Because broadband is such a competitive space, internet users can save money by shopping around. We recommend comparing broadband providers by things like price, speeds, data limits, contract length, and customer service. 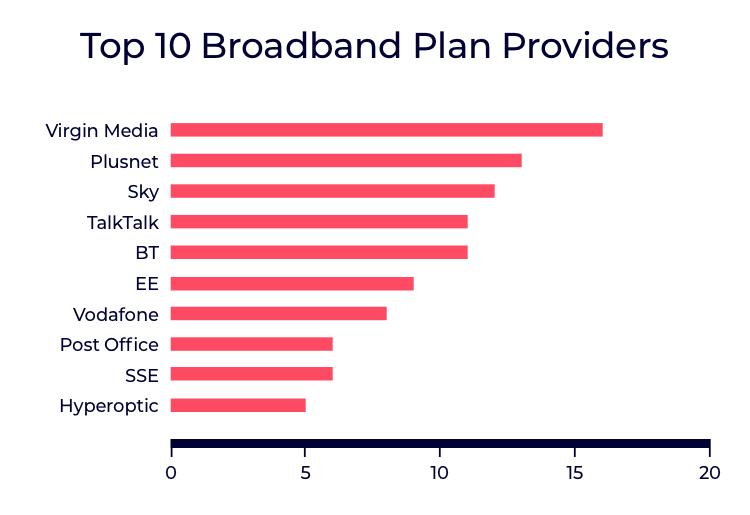 BT, EE, Plusnet, Sky, TalkTalk and Virgin Media serve about 95% of British broadband customers, although a number of smaller providers also offer great deals. Thanks to new consumer regulations, broadband customers must now tell customers the minimum peak-time download speeds they can expect, and customers may leave their contract if the speeds fall short of what is promised. Which broadband plan is best for you? We've searched the internet for "best of" lists from Britain’s top online newspapers, comparison sites, and tech publications, from The Standard to The Mirror, and PC Mag to Which?, to bring you the ultimate top 10 mobile plans superlist. Our top provider, Virgin Media, was mentioned in 16 of the 19 publications we checked. See the graph below for the rest of the numbers. Checking such a wide range of sources gives us the best unbiased consensus of the top broadband plans possible. Read on for more information on what each of these internet providers has to offer. Virgin Media offers plenty of choice, with 4 different 12-month contracts, 4 rolling monthly contracts, and bundles with TV and broadband. All 12-month contracts include a £25 setup fee. Prices start from £35/m for the slowest speeds to £50/m for the fastest. Virgin Media boasts the fastest speeds in the UK, with download speeds of up to 362 Mbps and upload speeds of up to 21 Mbps. Of course, speeds depend on where the customer lives. Plusnet offers a range of flexible options, including broadband-only, broadband and phone, or fibre broadband and phone deals. All contracts run for 12 or 18 months. The cheapest fibre broadband deal is £23.99/m, including 36MB download speeds, call plans from £4/m, and fixed-price broadband and line rental. This provider has developed a reputation for customer service. Plusnet’s UK-based customer support team works 365 days a year. It’s also big on getting its customers the best price for their needs, and promises a free account review for customers who are ready to renew their contract. Sky is another major multimedia provider that lets consumers bundle together TV, broadband, and home phone. Customers can find broadband-only deals for as low as £18/m. Bundles range from £33/m for basic needs to £42/m for unlimited streaming, gaming and downloading. Even before the new consumer regulations, Sky was already ahead of the game with its Guaranteed Minimum Download Speed. If Sky doesn’t fulfil the download speed promised to you within the first 30 days, you can claim your money back and move to another provider. TalkTalk caters to budget internet users, with long-term contracts that offer fairly good download speeds. Users can lock in a fixed broadband price for as long as 1-2 years. The best deal here is the 24-month contract for £22.50 / month, featuring 36 Mbps speeds, unlimited usage, and a 30-day “great connection guarantee”. As far as we can see, TalkTalk is the only one of the major broadband providers that offers to freeze broadband prices for as long as 2 years. BT offers 5 broadband-only packages and several bundles. Its cheapest broadband package offers 10MB download speeds for just £24.95 / month for an 18-month contract, including free line rental. The main reason to go with BT is for all the other benefits. Broadband packages include access to more than 5 million hotspots around the UK. All subscribers get free virus protection and parental control across multiple devices. BT has promised there won’t be price rises for contract renewals in 2019, and it even throws in rewards points for the BT Mastercard program. EE is well-known as a provider of mobile plans and broadband. Indeed, customers who bundle together broadband and mobile get an extra 10GB each month on their mobile 4G plan. EE’s most expensive 18-month contract promises 300 Mbps download speeds. This makes EE the second-fastest nationwide internet provider in the UK after Virgin Media. Vodafone offers 2 different price points, with £21/m for an average speed of 35 Mbps and £25/m for 63 Mbps. Both plans include free line rental and setup, and unlimited broadband usage. While Vodafone isn’t the only company that promises your money back if it achieves promised speeds, it does offer a higher level of confidence than its competitors. For the 63 Mbps package, it promises to return your money if it doesn’t achieve 55 Mbps—or at least 87% of average speeds. What the experts say: “Vodafone continues to offer extremely competitive fibre deals, currently having the joint cheapest 60Mbp+ deal.” - Which? Post Office is a smaller provider offering cheap subscription plans with download speeds to match many of the major broadband providers. Its 3 broadband deals range from £17 to £32 per month, including a guarantee that the price won’t rise before the end of the contract. This provider is a solid choice for anyone looking to add cheap home calls to their internet package. That’s because Post Office promises free line rental and has cheap call plans starting from £2 per month. What the experts say: “Post Office may not be the first provider that springs to mind when it comes to broadband but compared to major providers, it currently offers one of the cheapest standard packages.” - Which? SSE is best known for providing energy, although it also has a growing broadband (and phone) service. It offers 3 packages, from £18/m for 11GB speeds to £28/m for an average of 63 Mbps. All packages come with free line rental and the option of adding calls. SSE customers can enjoy benefits from the SSE Arena in London and the SSE Hydro in Glasgow. This includes exclusive presale tickets to big events and the opportunity to upgrade to SSE lounges. Hyperoptic is different from the big providers, in that it’s built its own fibre optic cables. By using its own network, Hyperoptic is able to offer broadband up to 900 Mbps—making it quicker than even the fastest major broadband companies. These speeds apply only to areas where it has already rolled out its fibre-optic cables. Hyperoptic offers 3 packages. For £21/m, customers get 30MB speeds. For £28/m, the speed rises to a very quick 150MB. And for £47/m, Hyperoptic offers a whopping 900 Mbps. Broadband is an essential consumer product, but we all have different needs. Thankfully, there are cheaper plans for people who only need a basic connection and pricier plans for those of us who need super-fast speeds for streaming or gaming. With so much choice in the broadband market, British consumers are the real winners.